The former royal bloodline of Russia, thought to be lost forever, has resurfaced. The newly found descendants have been embraced and issued honorary titles. Unbeknownst to the rest of the world, they bring with them a powerful addiction that will change the country forever. Through media manipulation, government deception, and the power of fame, Prince Mikhail and Princess Milena Romanov are able to spread their addictive lifestyle across the country. Fueled by silve cocaine and their own blood, this new populace is devoid of ethics. The addiction has transformed everyday citizens into freakishly strong and morally unhinged individuals. They are known as haemans, and they have taken over Russia. Sevrick Bykovsky is one of the few humans to have escaped. He now lives hidden within the forested outskirts of St. Petersburg. Forced to leave behind his fiancée, Arinadya Tarasova, in the grip of her newfound addiction, he has devoted his life to save her. Accompanied by a ragged band of freedom fighters, they struggle each day to survive. 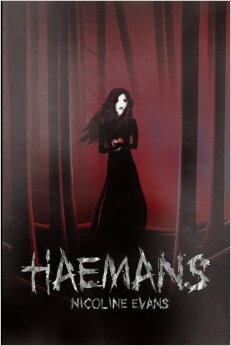 HAEMANS is a dystopian thriller that mixes gothic urban-fantasy with survivalist suspense. This debut novel from Nicoline Evans depicts a world where the villains rule and the heroes are scarce. It follows one man’s quest to save the woman he loves from a dangerous new society where self-destruction is deemed fashionable. HAEMANS is a story about survival and perseverance through the darkest times, and a reminder that we all can come undone. My name is Nicoline and I love to invent new worlds for readers to get lost in. My goal while writing is to create a safe place for people to forget about the heavy things in their own lives, even if it is only for a few hours of the day. I graduated from Rutgers University - New Brunswick, NJ as a communications major. After taking every creative writing course they offered, I realized writing was my passion. Random things about me? I am a certified scuba diver, I revel in new adventures, and I believe in all things magical.